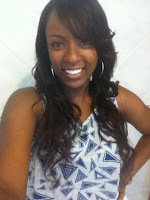 Justine has completed her first year of study at the University of Georgia School of Law and is one of three students participating in the 2012 pilot of the InteRDom Correspondent Program. She is participating in the 2012 10-week Graduate and Gap Year Program. So, the time is finally here and I couldn’t be any more excited—my journey to Santo Domingo, Dominican Republic begins tomorrow! It seems completely unreal as I’ve been dreaming about visiting the DR ever since I can remember, and tomorrow, thanks to InteRDom, my dream becomes reality. Through InteRDom, I will be able to combine my interests in both the legal profession and the Spanish language through an internship in the legal department at a large, private Dominican insurance company. Although I’ve been studying Spanish for the last eight years, I have yet to travel to a Spanish-speaking country so this is a huge milestone for me! Once in the Dominican Republic—in addition to interning of course—I plan on taking in as much of the culture as possible (which, for me, largely means food!). 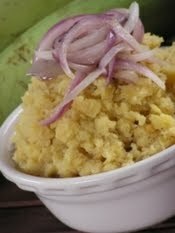 I cannot wait to try authentic mofongo, a fried plantain dish stuffed with various meats, and mangú, a boiled plantain dish, us ually served for breakfast. The program recommends that we don’t eat street food for health purposes, so I’ll be sticking to the cuisines of established restaurants to fulfill this desire. Besides eating, I plan on travelling throughout the entire island. (After all, when again will I be able to do such extensive travelling?). 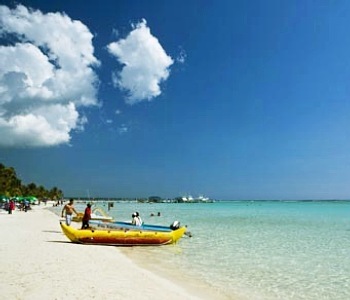 The first place that I want to visi t is pretty touristy—Boca Chica, the beach nearest Santo Domingo. 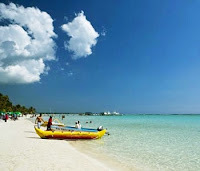 I’ve done some research on Boca Chica and found that in addition to the immaculate white sands, the depth of the crystal clear water rarely changes and there are no waves. Sounds like paradise to me! Lastly, in addition to interning, eating, and travelling (by now, you’re probably thinking, “what else will you have time for? !”), I am really hoping to enroll in bachata and merengue lessons so that I can develop a new talent to show off once back in the States. While I could go on forever, my flight leaves bright and early at 7 AM, so that’s it for now. Once I am settled into my Dominican apartment, I will update you all on my travels. Stay tuned because I will be blogging about every bit of this once-in-a-lifetime experience! Ciao!